Standards: Speaking and Listening SL1, SL2, SL3, SL4, and SL6. This strategy is well labeled because it involves one group of students looking in on a smaller group of students in a manner not unlike watching fish through the glass of an aquarium. The small group carries on a conversation about an issue or topic while the outside group listens and prepares questions and comments for the students in the "bowl". These roles are rotated to ensure that all students play an active part in speaking, listening, and questioning. In advance of a text-specific discussion, demonstrate the format and expectations of a fishbowl discussion. This is best accomplished in a “dry run” of the activity. Ask for four or five volunteers to sit around a table or cluster of desks in the middle of the room. Have the other students gather in an outer circle. 1. Identify a topic for class discussion. The more controversial and charged the issue, the greater the level of engagement on the part of students. Thus, a topic in science such as the water cycle for students living in arid and semiarid parts of the country might be considered from an environmental perspective resulting in the following issue: The region needs to increase the volume of potable water in order to develop and expand. How can this be done without upsetting the current ecological balance? 2. Before the fishbowl discussion begins, ask students to turn to a neighbor and talk about their ideas and opinions related to the issue. Tell students to take notes on their discussion. Allow enough time for a reasonable exchange of ideas and viewpoints, which can be determined by moving around the room to monitor and facilitate. 3. Form the inner and outer circles and tell students in the inner circle to talk about the ideas and opinions raised when conversing with a partner. 4. The other students listen carefully and take notes or jot down questions to share afterward. 5. Allow a reasonable amount of time, getting involved only if the discussion dies or to ensure everyone is contributing and taking turns. 6. Ask the students in the outer circle to comment on the discussion they observed and to ask questions of the inner circle students. 7. 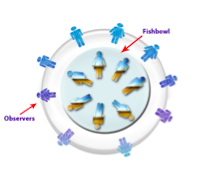 Gather another small group of volunteers and continue the fishbowl process until all students have had the opportunity to be inside the fishbowl. Standards: If students are discussing print and media texts, this strategy has the potential to address all the Standards for Reading Literature and Reading Informational Text, the Standards for Speaking and Listening SL1, SL2, SL3, SL4, SL6, and the Standards for Writing W1, W2, W3, W4, W8, W9, and W10. 1. Prior to the discussion, prepare Fishbowl Discussion Topic Questions that address central concepts and themes of an assigned text. Assign the questions for homework. Each discussion topic should include multiple questions that require inferential thinking and leave room for debate. 2. Organize the room with an outer circle and an inner circle. 3. Assign each student a letter based on the number of discussion topic questions. For example, if there are four questions, students are assigned A, B, C, or D. However, letters do not necessarily correspond to numbers, so being assigned the letter A does not have to mean that students assigned the letter A will be discussing topic #1. This creates a need for students to be prepared to discuss all topics. 5. Give students seated on the outside circle an Outer Circle Observation Sheet. For every discussion group, students in the outer circle must choose at least two students in the inside circle to observe. While the discussion is happening, the outside circle records notes in the chart. Students only complete the observation sheet when on the outside of the circle. 6. Set a time for each discussion. Within this time, no teacher assistance is given, even if students are not talking. Instead, act as a participant, sitting in the outside circle, completing the observation sheet and informally assessing student comprehension. After students have participated in several fishbowl discussions, an option might be to give students a formal assessment based on their contributions using a rubric as students discuss. 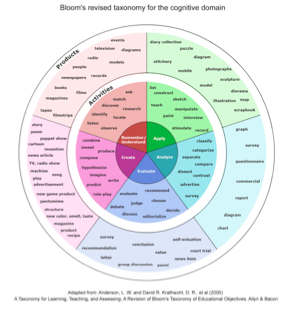 A sample Fishbowl Rubric is included here. 7. Once the allotted time is up, the inside circle sits quietly and the outside circle provides spoken feedback, both positive and constructive, without directly using student names (for example, “The person I observed…”). Facilitate this conversation, ensuring that feedback is respectful, helpful, and clearly explained with evidence. Once feedback has been given, you may choose to open the discussion to the whole class if the topic was not discussed thoroughly enough during the allotted time. The procedure continues until all topics have been discussed and all students have had an opportunity inside the circle. 8. Ask students to complete a Ticket to Leave in which they self-reflect on their performance and contributions and ways to improve. Standards: This strategy has the potential to address the Standards for Reading Literature and Reading Informational Text as well as Standards for Writing W1, W2, W4, W7, W9, and Standards for Speaking and Listening SL1, SL2, SL3, SL4, and SL6. 1. Read, view, and/or listen to a series of texts on a content-area topic. 2. Write and answer three questions on the texts. Only one of these questions can be on the thinking actions in the Remember / Understand section of Bloom’s taxonomy. The other two questions need to be from different sections and address other types of thinking (sometimes referred to as “higher order thinking”): Apply, Analyze, Evaluate, or Create. In all cases, do not write questions that can be answered in only a few words. 3. Be prepared to contribute relevant facts, observations, connections, analysis, evaluations, etc. to the conversation. You must add new information and understanding to the discussion, not just repeat a text or rephrase someone else’s answers and ideas. 4. Ask at least one relevant question of the other participants. 5. Use appropriate communication skills and be respectful of other participants. DO raise your hand and wait to be recognized by the facilitator, look at other students when talking, and use complete sentences. DO NOT interrupt others, monopolize the conversation, engage in personal attacks, chew gum or engage in distracting behaviors. 6. Make a summative closing statement. 7. Listen closely to the speakers. Pay attention to the discussion. 8. Write down each participant’s question, at least two relevant or insightful comments made during the discussion, and one positive commentabout the discussion process. Click here for the Fishbowl Assessment Checklist handout developed by Mark Fellowes.